August 15, 2018 might have been a typical day at the salon for Atlanta-based artist Kayluh Stewart (@kayluhskolors). But when she posted an image of a lob with a deep base and iced-out ends, she captioned it "Toasted Coconut," and Instagram fell in love. "When I posted the picture, my life changed," Stewart says. "It immediately blew up. Every single day I woke up to numerous website editors reaching out to me for permission to publish and share my work." Stewart opened her salon, Elysian Studio, last December, where she is known for her work with blondes. She says she has noticed clients coming in who are fascinated by the icy hair trend. Stewart's marketing manager, Ella, was also looking to partake in this trend. But neither one of them anticipated the success the post would have. "We started with her natural level 7 base," Stewart says. "We used some darker tones for depth, but Ella really wanted her ends to be as icy as they could be. We decided on an extreme contrast of colors. I deepened her base with Wella Color Touch 5/0 and 5/81, and I added 7/0 into my formula for lowlights with some 7/3 to fill. I then toned the look with Schwarzkopf Vibrance 9/1 with clear. I also used Olaplex, as always. We were able to achieve the final look in one sitting." Stewart posted three different images of the hair, but the second image was the most popular. MODERN reposted that particular picture on August 16, and it has since received more than 6,100 likes and 110 comments. Stewart says having MODERN repost the image meant so much. 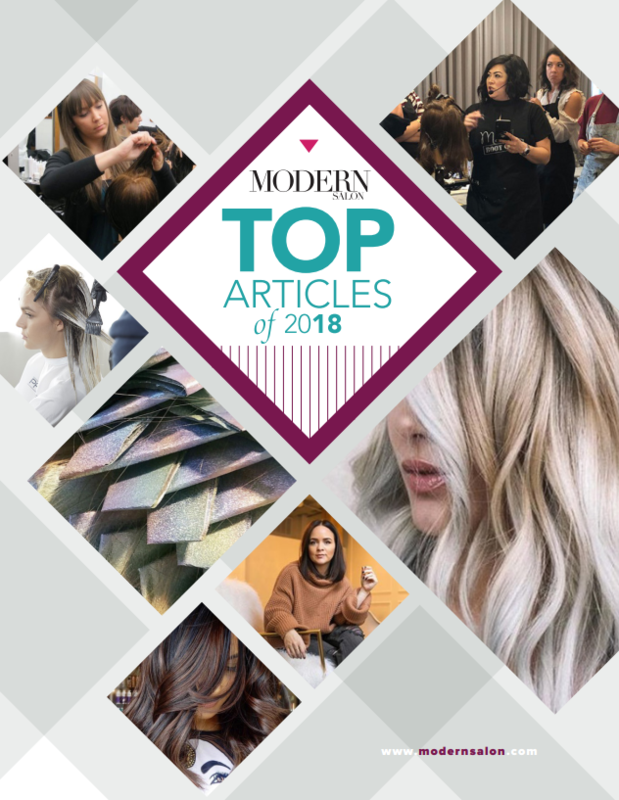 "This time last year, I had just found out I won the hair contest Blonde's Best Friend by Keune and MODERN SALON," she says. "You changed my career then and there. I was flown to New York to do Artist Session, and it changed everything; I learned so much." Since the day of the original post, the image and Stewart have been featured in publications such as Vogue, Allure, Glamour, Cosmopolitan, Marie Claire, Elle and several other websites . "I was crying daily," Stewart says. "It was published in Singapore, Germany, Italy, Barcelona, Russsa; I was an emotional mess. I woke up to hundred of new followers daily and tons of new messages from potential clients and fellow hairstylists." Stewart says the post has changed the way she looks at and uses social media. "Having social media as a tool to share and to learn so much has been such a gift," she says. "I am always learning new things from other artists on here. In the past two years since becoming licensed, I have built a full clientele from social media. Every single day is like a dream; I can't believe it's my life I'm living."